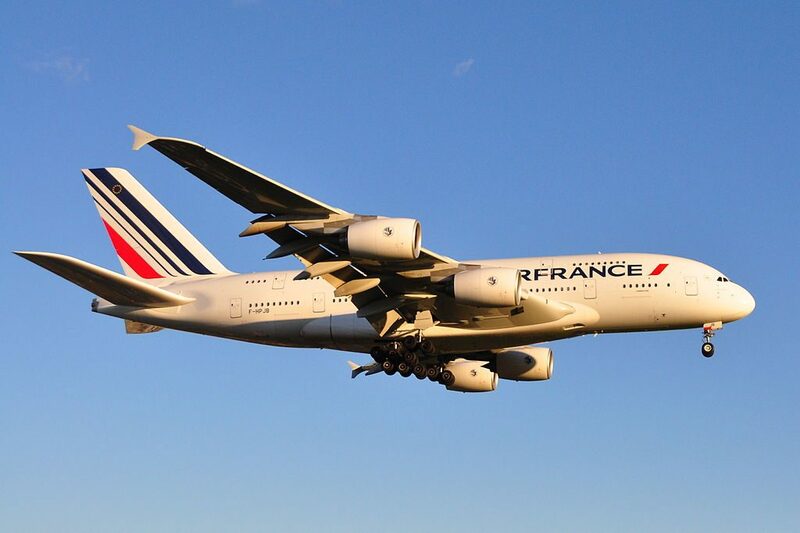 Air France Fleet Airbus A380-800 Details and Pictures. 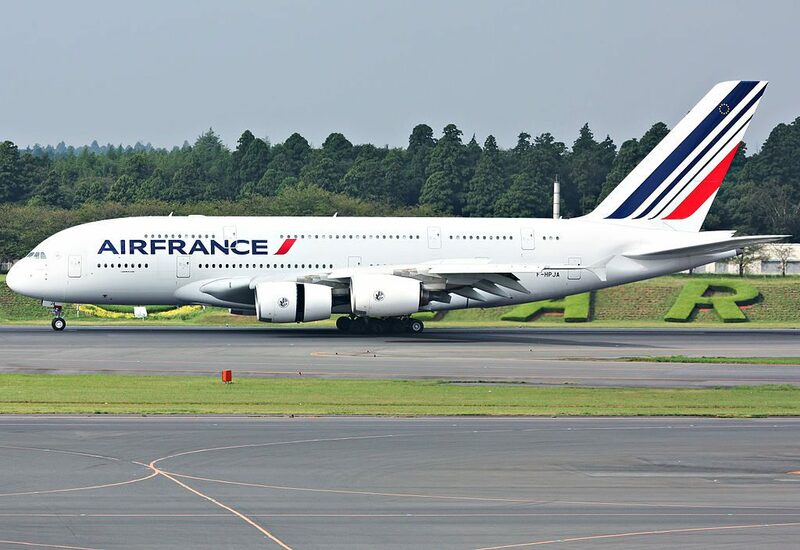 Air France operated 10 super jumbo aircraft Airbus A380-800. 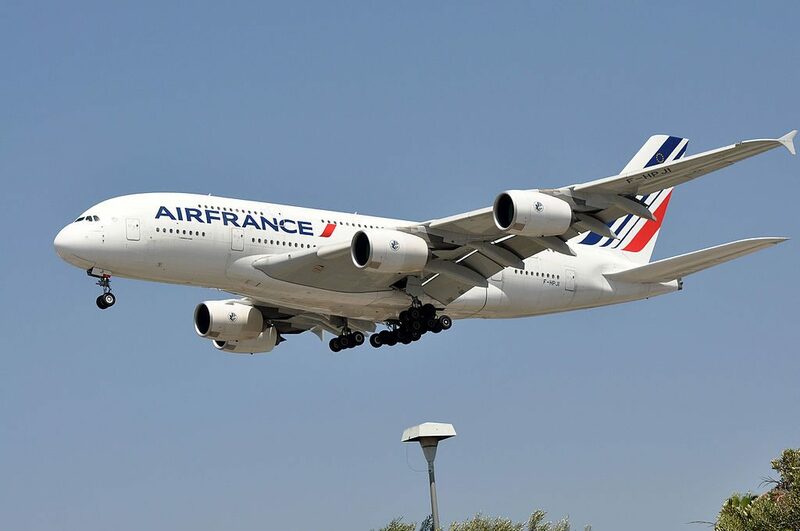 Airbus A380-800 is two-decked airplane that may transport 516 passengers in 4 classes. 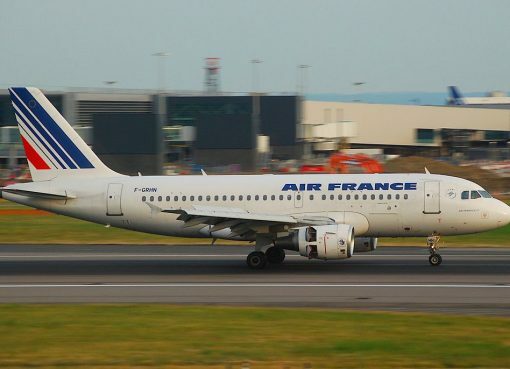 Air France operates this aircraft on a variety of select, high density routes on the Air France network. 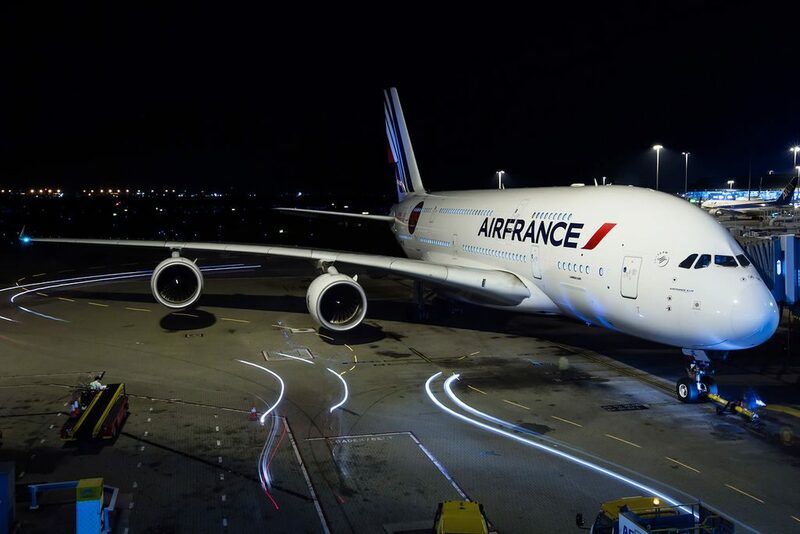 Built with the latest technology, the A380 is not only the most silent aircraft in its class but its tremendous size also provides the most comfort. 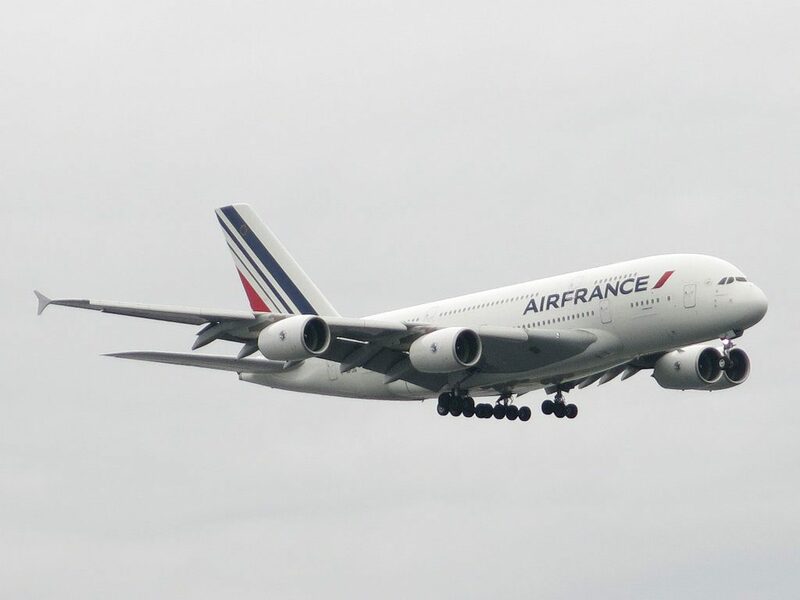 Airbus A380-800 is the largest passenger aircraft, comparing with other wide-body aircraft like A330, A340, A350, B747, B767, B777, B787. 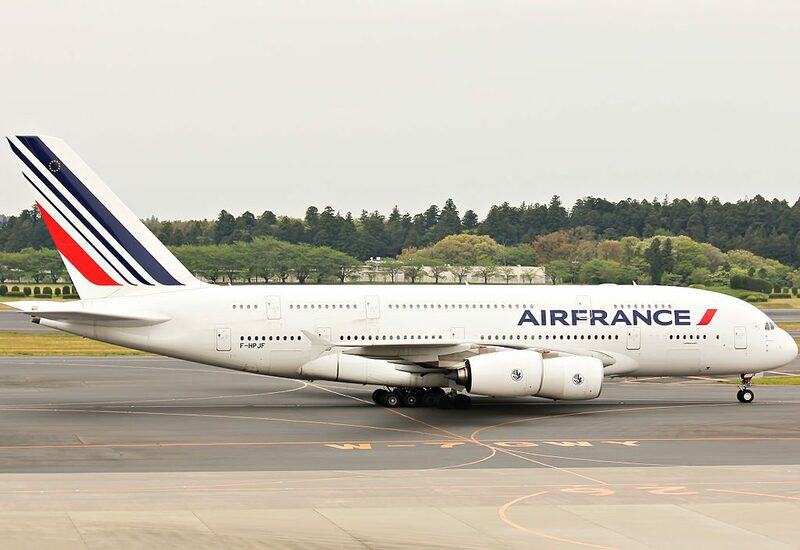 This A380-800 cabin version reflects Air France’s original configuration with Premium Economy class located on the upper deck, behind Business Class. There are several rows of Economy Class located on the upper deck on this version. The lower deck has the seats in two classes: first and economy. First class (La Première) has 9 open suites. All of them are standard. Economy class of the upper deck consists of three sections. First section includes 17 rows of seats. There are totally 148 seats here. Most of them have 3-4-3 configuration. 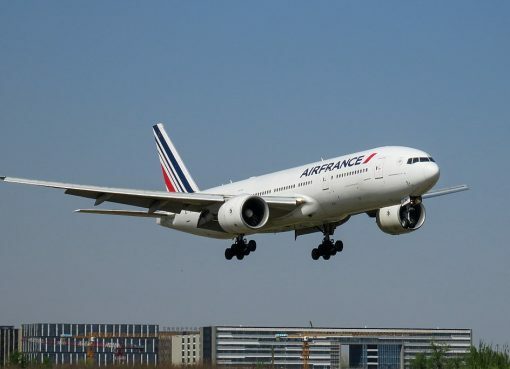 The seats of the 10th row are designated by Air France as preferred seats. To reserve these seats an extra fee should be paid. Among disadvantages of these seats is close location of the lavatory and galley. As there are no seats in front, the seats 11A and 11L have extra legroom. These seats are considered good seats. Proximity of the lavatory and galley may cause discomfort to passengers of the seats 11C, 11J, 12C, 12J, 14C, 14J. Passengers traveling with infants are often seated on the seats 15DEFG as these seats have bassinet location. Also the legroom of these seats is limited. Close location of the lavatory may represent problem as well. Passengers tend to gather in the area of the last rows of first section causing discomfort to passengers of the seats 26DEFG and for passengers of the 27th row. Behind the exit row the second section of economy class seats is located. This section has 13 rows of seats containing 121 seats. 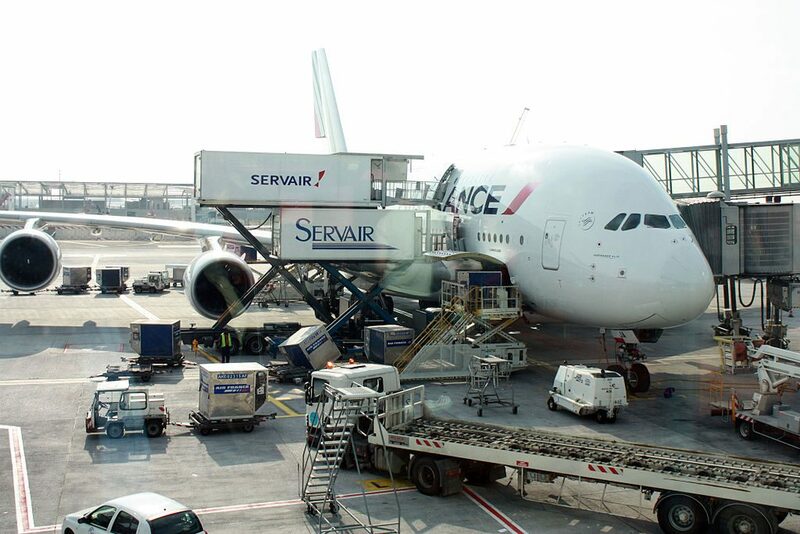 The seats 30ABC and 30JKL are designated by Air France as preferred seats. An extra fee should be paid to reserve these seats. These seats are considered good seats as passengers of these seats will be able to take advantage of extra space for their legs. However, proximity to the lavatory may cause discomfort. The other seats of the 30th row, i.e. the seats 30DEFG on the contrary have limited legroom because of the bassinets’ location. Close location of the lavatory is another disadvantage of these seats. Due to missing seat in front, the seat 34D has extra legroom. This seat is designated by Air France as preferred seat to reserve which an extra charge should be paid. Close location of the galley may represent a problem to passengers of the seats 40DEFG, 42ABC and 42JKL. Behind another exit row and galleys the third section of economy class seats is located. There are 8 rows of seats here. The seats of the 7 rows have 3-4-3 configuration. The last row has 4 seats. So, there are 74 seats here. The seats of the 45th row have less space for passengers’ legs because of the bassinets location. Proximity of the galleys may cause discomfort as well. 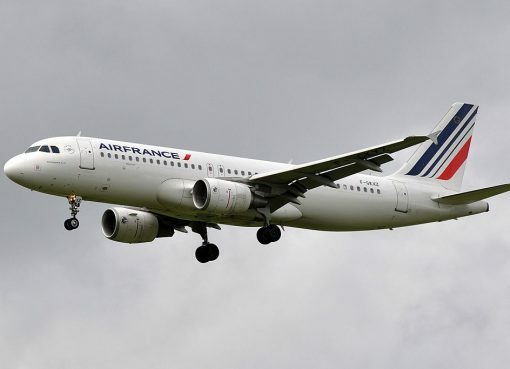 Proximity of the lavatories and stairs will represent a problem for passengers of the seats 51ABC, 51JKL and of the last 52th row of the section. These seats are considered bad seats. 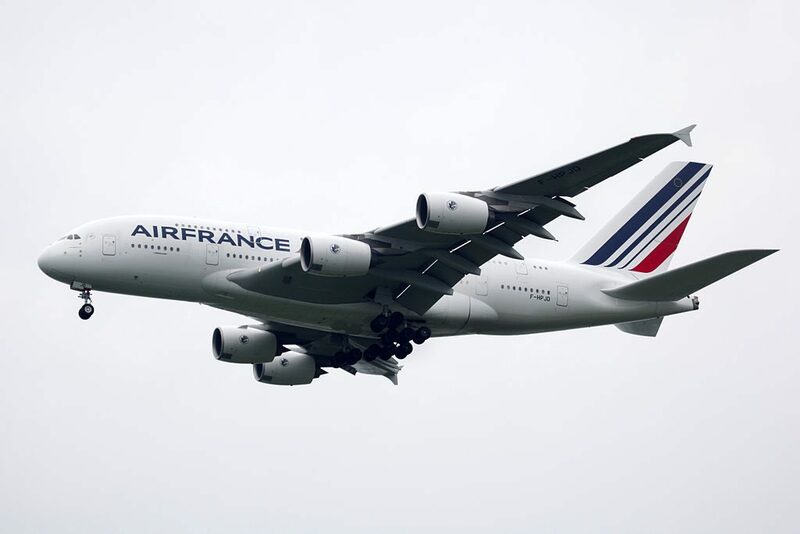 The Upper deck contains seats of three classes: business, premium economy and economy class. The major part of the upper deck contains the seats of business class. These seats are located in two sections. First sections has 26 seats. Most of them have 2-2-2 configuration. The seats of the 60th row have smaller TV screens that have 9 inches instead of 15. As the TV screens are built-in the armrests the width of these seats is reduced a little. Close location of the lavatory may represent a problem for passengers of the seats 60ABE. Proximity of the galleys and lavatories will cause discomfort to passengers of the seats 64AB. The second section of Business class seats consists of 9 rows of seats that have 2-2-2 configuration. As the seats of the 65th row are located near lavatories, it may cause discomfort to passengers of these seats. Passengers traveling with infants are often seated on the seats 65EF. Behind the exit row 38 seats of premium economy class are located. Passengers of the seats 80EFG may have less legroom. Passengers traveling with infants are often seated here. The seats 81AB and 81KL are considered good seats as they have extra space for passengers’ legs. But location of the TV in the armrests may be bothersome. In the tail of the airplane the seats of economy class are located. 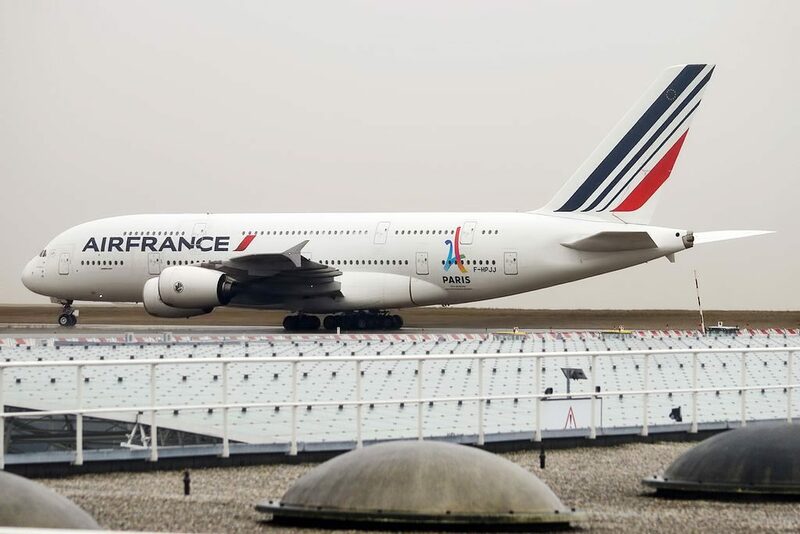 The major part of these seats is are designated by Air France as preferred seats. These are all AB and KL seats of the rows 88-94 and the seats of the 90th row. An extra fee must be paid to reserve these seats. The seats of the 88th row have limited space for passengers’ legs. As the tray tables and personal TV are built-in the armrests the width of the seats 88AB and 88KL is reduced a little. Position of the bassinet may be bothersome for passengers of the seats 88DEFG. The main disadvantage of the seats 89AB and 89KL is limited recline. The best seats here are the seats of the 90th row. Passengers of these seats will take advantage of extra legroom. However high traffic in this area may cause discomfort. Passengers of the seats 91AB and 91KL will feel comfortable thanks to extra space for their legs. But the width of these seats is reduced. Close location of the galley and lavatories will represent problem for passengers of the seats 93AB and of the seats of 94th row. These seats are considered bad seats. Audio. Each seat on this plane has a personal entertainment system with 16 radio programs. Video. Each seat on this plane has a personal entertainment system with a variety of video and audio options. AC Power. 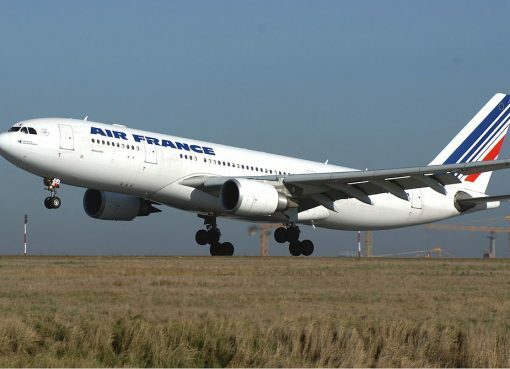 Power is available only in La Première, Business, and Premium Economy class. 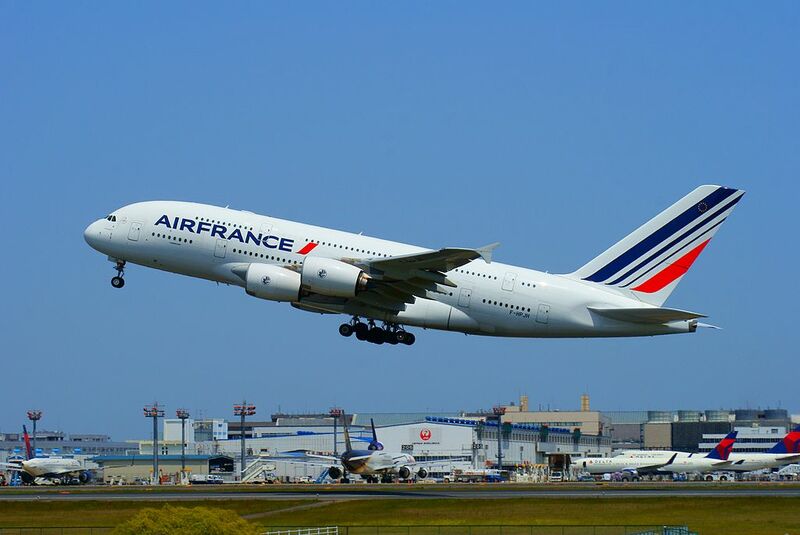 Thanks to visiting AirlinesFleet.com and read article : Air France Fleet Airbus A380-800 Details and Pictures.